Drone Education Services is a full-service drone educational company, which provides information over a wide variety of mediums. We are a reliable source for educational books, seminars and presentations, and educational videos about drone technology information and implementation and its benefits to various industries. The first division being rolled-out is the aerial division with a focus on real estate. Read on to discover more about our company. “It all began with a news report. I was visiting my grandfather in 2014 when an evening news report came on about privacy infringement using a drone. The reporter placed the drone in front of a multi-million-dollar home and then took off. As it rose into the air, I began to see the world from a different perspective. I am a real estate valuation expert, and what I saw in that report was mind blowing. I was fully entranced as I began to see the home in a totally unique way. Not only did I see the home but I also could see the layout of the property and the other improvements like the tennis court, gazebo, and pool. It showed the impressive architecture and quality of construction. After the report concluded, I looked at my grandfather and stated that this was what I was going to do with my life. From that point on, I could not sleep and kept thinking “how do I get into this business?” I didn’t even know anyone who owned a drone. I decided that if I was going to get into the business, I needed to understand it. When I arrived back in Atlanta, I began to explore the idea of putting together an educational program on using drones in real estate. I contacted The Atlanta Chapter of the Appraisal Institute’s executive director and told her that I wanted to put a program together to present to the chapter. I assumed I would have six months but she said of course and gave me 2 ½ months to put a program together for the Atlanta Chapter and the South Carolina Chapter of the Appraisal Institute in November 2014. Up to this point, I still did not know anyone who owned a drone and there wasn’t that much reading material that had been published. I was able to get a couple of books on drone career opportunities. There were no magazines and limited internet resources. In fact, everything published seemed to be about the military aspects of drone technology, which is not what I wanted. I needed to find someone who was in the industry. Then it began to happen. A good friend connected me with a Hollywood prop designer who invited me to his house to fly drones. He had built his own from scratch, and I understood very little of what he was telling me. We flew drones that day. It was enlightening, and I was hooked. He was able to share with me some valuable information on flying and filming that I still use in my seminars today. I then connected with a drone company that was getting into agriculture. They invited me to lunch and shared with me information on crop inspections and forestry. It was groundbreaking and far more advanced than I thought the technology could do. They were also training pilots for agricultural inspections. They, unfortunately, are no longer in business. Finally, I had the meeting that I was looking for. I was at the bank sharing my story with a teller when the bank manager overheard our conversation and called me into her office. She shared with me that she had just signed a drone company up that day and gave me the name and phone number. It was Roman Molla of FlyWorx. Not only did he set up to meet with me but he also agreed to film the videos I needed for my seminar. I couldn’t believe my good fortune. I had designed a Highest and Best Use analysis for real estate and incorporated a drone into the presentation. Not only did Roman film the subject property but he also filmed all of the comparable properties. Not only that but he also gave me additional material to be used in my first seminar. To prepare for that first seminar, I purchase a Parrott AR 2.0. It was a big bulky drone with a fixed camera and the video was shaky at best. However, I was able to put enough material together to complete the seminar. I delivered the first seminar on November 2014 to the Atlanta Chapter of the Appraisal Institute. I was a nervous wreck but I managed to plow through it and got a good response from the crowd. I then delivered the seminar a week later to the South Carolina Chapter. Lamar H. Ellis, III, FAA Certified Remote Pilot of Small UAS is from Atlanta, GA. He currently serves on the 2018 Atlanta Chapter of the Appraisal Institute’s education committee and is an approved instructor with the Appraisal Institute. He also holds the commercial and residential real estate appraisal designations of SRA and MAI. Using his 30 years of real estate valuation experience, Lamar was an early adopter of drone technology for real estate. From the first day Lamar became aware of drones, he realized the impact on valuation and a way for appraisers to use it in their practices. In 2014, Lamar developed a seminar for the Appraisal Institute entitled “Drone Technology and Its Impact on the Appraisal Industry” with assistance from FlyWorx, LLC. Flyworx, LLC is a full-service unmanned aerial company that provides consulting services in marketing, promotion, presentations, interviewing, and assisting in drone operations. Lamar went to work for FlyWorx, LLC in the winter through spring of 2016 to gain hands-on experience in drone operations, business development, and sales. 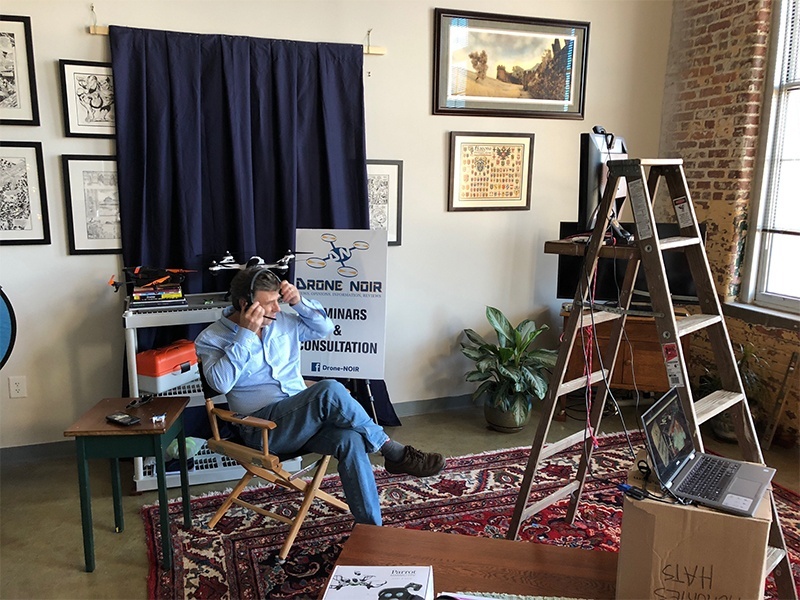 He provides consultation with companies all over the United States on applications and business development with drones, is a published author, and assists in business development for several Atlanta-based drone companies. Being an early adopter of this new technology, Lamar has also shared his knowledge with a variety of other industries that would be majorly benefited. He has presented seminars in 29 states to various chapters of the Appraisal Institute, National Association of Realtors, State Bar of Georgia, divisions of the EPA, East Coast Insurance Brokers conference, the Georgia Erosion and Agricultural Expo, International Drone Day 2016, Turner Broadcasting Systems, International Right-of-Way Association, Conservation groups, American Society of Farm Managers and Rural Appraisers, American Society of Appraisers, and various other real estate entities. Lamar also donates his time to helping elementary and middle school children realize the benefits of STEM education (Science, Technology, Engineering. and Math) through drone technology. There is an abundance of videos and photographs embedded into the presentation to assist in the learning process and keep attention. By the end of the seminar, you will understand the necessary steps to be able to utilize aerial technology in your business practice. Whether you decide to fly or intend to hire someone to fly for you, you will leave the seminar with the knowledge to fly safely and within the context of the rules. Attendees of the seminars often state that they had no idea how big the drone industry is and how significant the impact will be. The seminars are well received and well attended. March 22, 2018, with Appraiser ELearning. Drone Appraising. They are not for every assignment, but drones are beginning to have a direct effect on the valuation market. As a choice drone educational company, we provide a range of instructional lessons through books, seminars, and videos. Learn how to fly a drone and discover the many benefits of drone technology. For more information about our drone educational resources, call or email us.